As the sun is setting on Skokholm and the Skomer Marine Nature Reserve, the Manx Shearwaters are rafting, awaiting the cover of darkness to return to their nests on these beautiful Pembrokeshire Islands. The darker it becomes, the noisier they become. 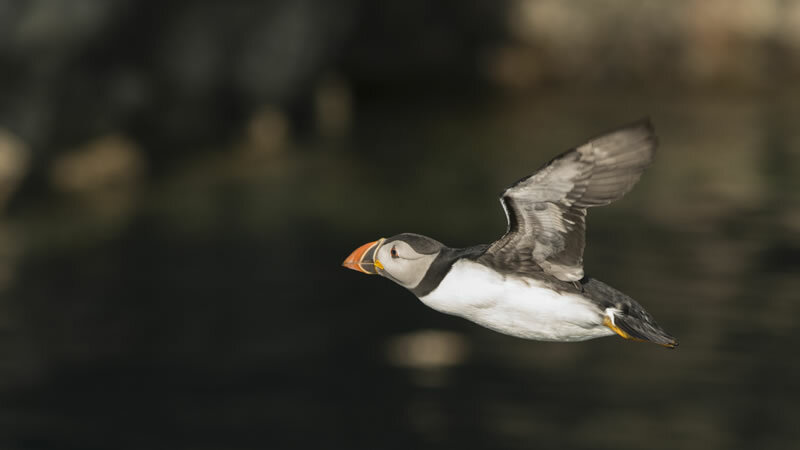 These weekly cruises are an experience not to be missed as an expert guide will help you to enjoy the great rafts of Puffins, Guillemots, Razorbills & Manx Shearwater as they return after a day’s fishing from far out at sea. Depart 7pm Tuesday, Wednesday & Friday. 16th April – 2nd August. Trips are subject to minimum number requirements. Tickets are refundable only if we have to cancel the trip. Every effort is made to contact you prior to the trip departing if we feel that the conditions are not appropriate for the trip to go ahead. Cancellations are at our discretion and will be subject to tides, forecasts and sea conditions. We will endeavour to offer an alternative trip or the possibility of rescheduling.